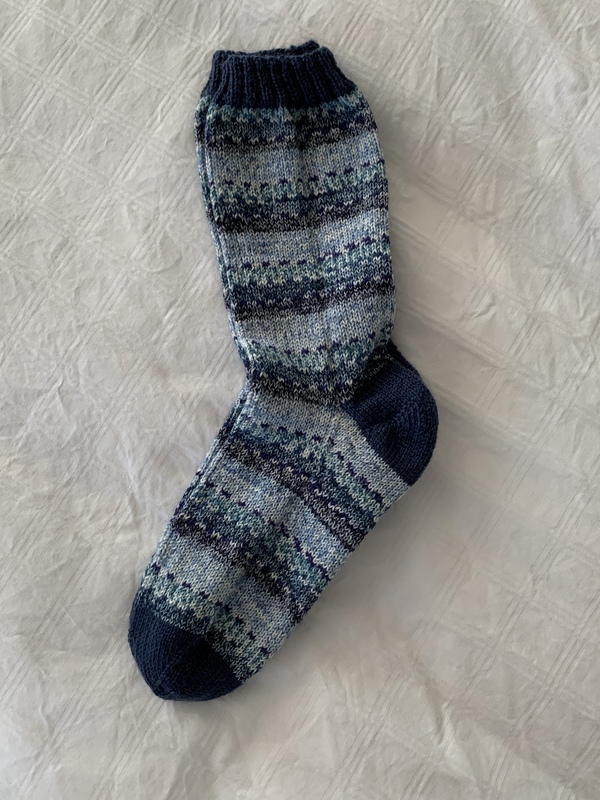 Finished these blue socks last evening. They may end up in my sock drawer. I like the way the variegation worked out – the staggared blue line separating colour sections makes the design quite lively. 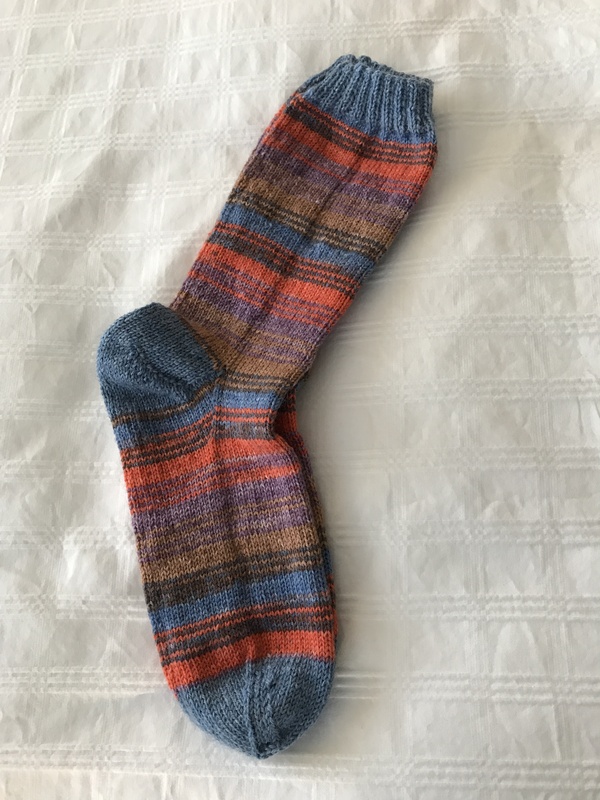 I’ve already started the next pair – this new pair from the stash of leftover yarn from other socks – there’s lots of it in the leftover basket…. Finished last evening. Into the stash they go. I was pleased with how the blue solid came very close to the blue in the variegated yarn. Can’t leave the needles empty – started a new pair, predominantly red/pink. I have two 100gm balls of variegated yarn left in my collection. Time to go through the yarn leftovers basket to see if I can find some combinations that will work. Each leftover is enough to make a pair of legs so two leftover balls will make a pair of socks, if I can find combinations of variegations that will work nicely together. That leftover yarn could keep me going for quite a while – there’s a lot of it there. Finished these socks yesterday. Used Opal yarn: Courage Of The Morning Sun. I loved the colour combination and the way it knit up. I happened to have a ball of Sisu yarn in a complementing shade of burgundy to go with the burgundy in the Opal yarn. It set up a striking pair of socks. The only challenge, which you can’t see in the photo, is that I didn’t quite get the start point for the second sock right. 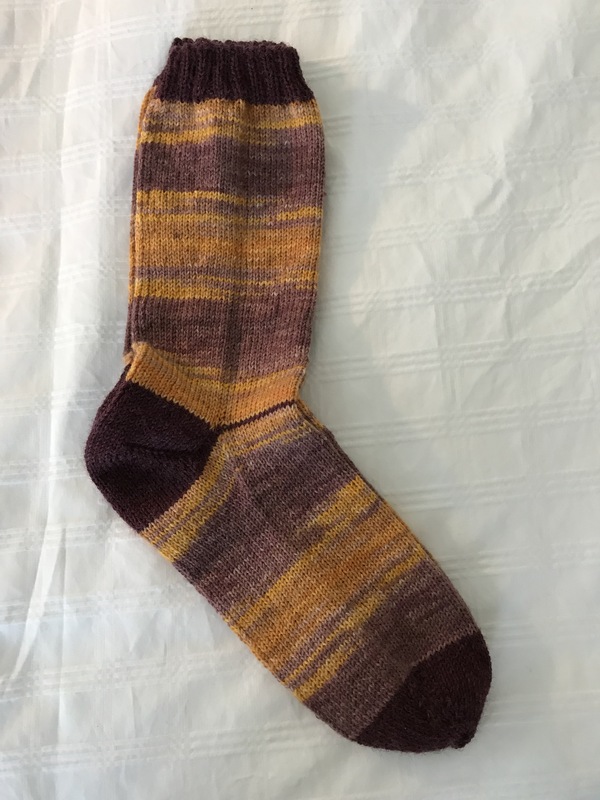 I didn’t remove enough yellow yarn before starting the sock so the strips don’t line up perfectly between the two socks. Given the nature of the “pattern” it doesn’t really matter. Nobody is ever going to notice when I wear them. Last month shopping for yarn at Have A Yarn in Mahone Bay NS, I came across this wool/cotton blend yarn. I’ve seen the yarn before and was hesitant about the feel of it and potential lack of stretchiness because of the cotton blend. However, I thought the colour combination was interesting so I decided to try a pair of socks. The yarn is 45% wool, 35% cotton, 13% polyamide, 7% polyester. It’s plied in such a way that there’s quite a bit of stretch when you pull on the yarn. 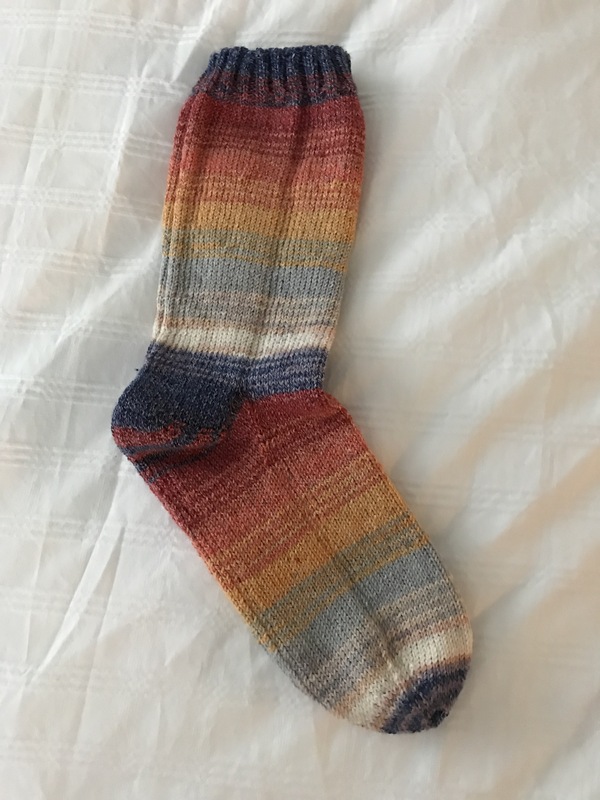 However, the socks, now knitted using the same number of stitches and same needles I use for wool socks, have come out with a looser fit than my regular wool socks. It will be interesting to see what happens when they’re washed. 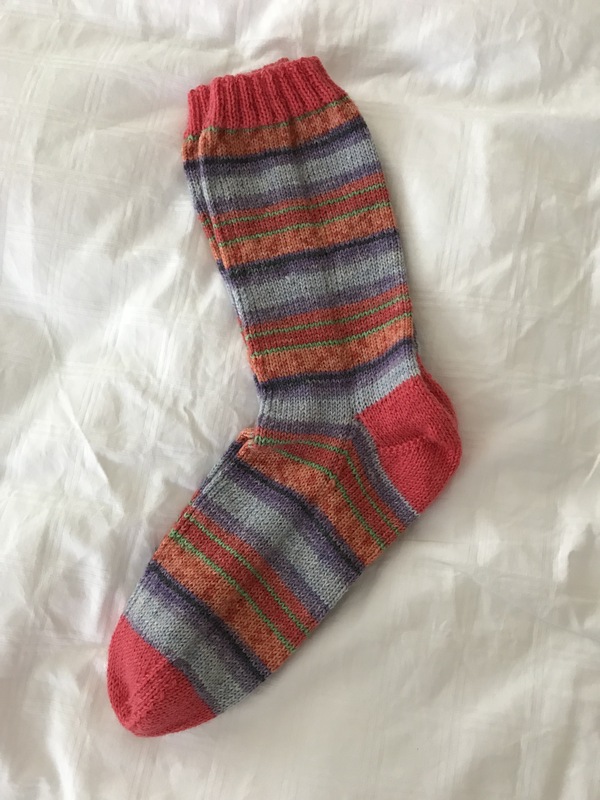 My wool socks return to their original fit when machine washed in cool water and air dried. I’m hoping the same will happen here – maybe even a bit of shrinking because of the cotton content. Don’t think I will use the yarn again, though. 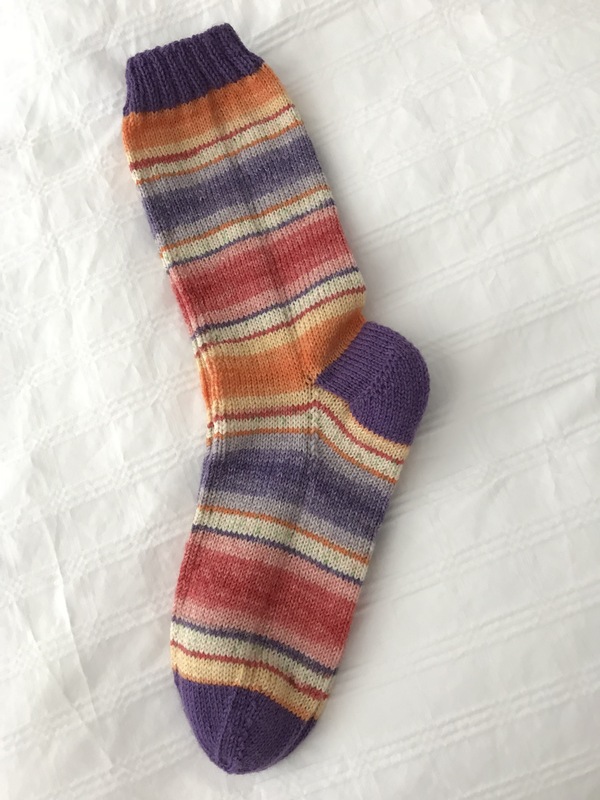 I had no comparable yarns to use as contrast for cuffs, heels, toes, although this particular colour selection turned out a lively sock without contrast. I only bought the single ball of this yarn. I’ll be returning to using my usual wool (75%)/polyamide (25%) superwash yarn. Well, these socks turned out nicely. Finished them last evening. They were fun to knit because the bright colours changed often and resulted in a pleasing pattern. Into the stash they have gone. While I do have sweaters in peach and shades of purple, I have enough socks in those colours I don’t need another pair. 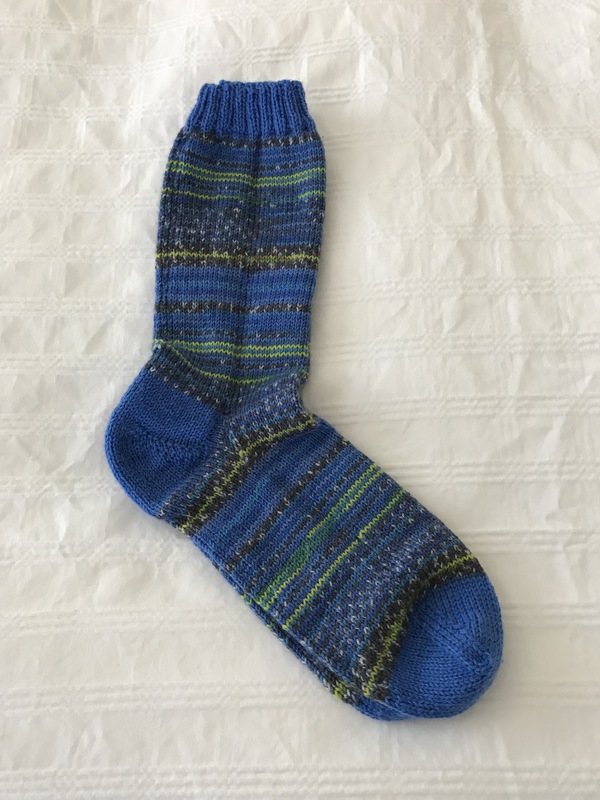 Two weeks ago I started knitting this pair of socks – had a solid blue for cuffs, heels, and toes that blended nicely. I didn’t think anything in particular about the colour combination until I was knitting in the group last Friday afternoon and someone commented they looked like Nova Scotia tartan. Since then several people have remarked on these “Nova Scotia Tartan” socks. Similar colours for sure: the royal blue and yellow with hints of white. 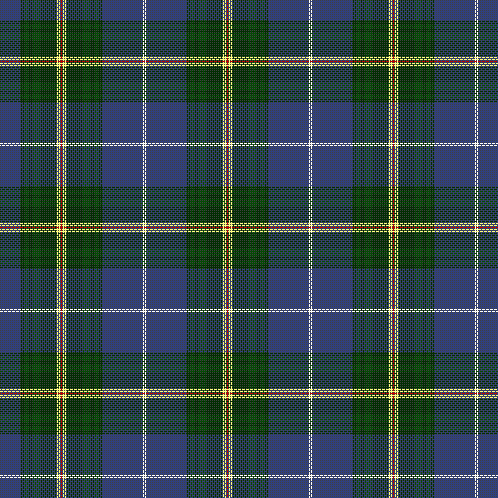 The tartan has both medium and dark green along with a fine red stripe. But I guess you could say the socks do have the flavour of the NS tartan. Anyway, the socks are now finished and in the sock stash. I have lots of blue socks in my drawer so these will be passed on to a deserving recipient for a birthday or holiday gift. Started the next pair, immediately, as usual. I’ve got this far today. Added the windows and the handrail (lots of stitching on both). Added shading to the decking and stitched the boards. 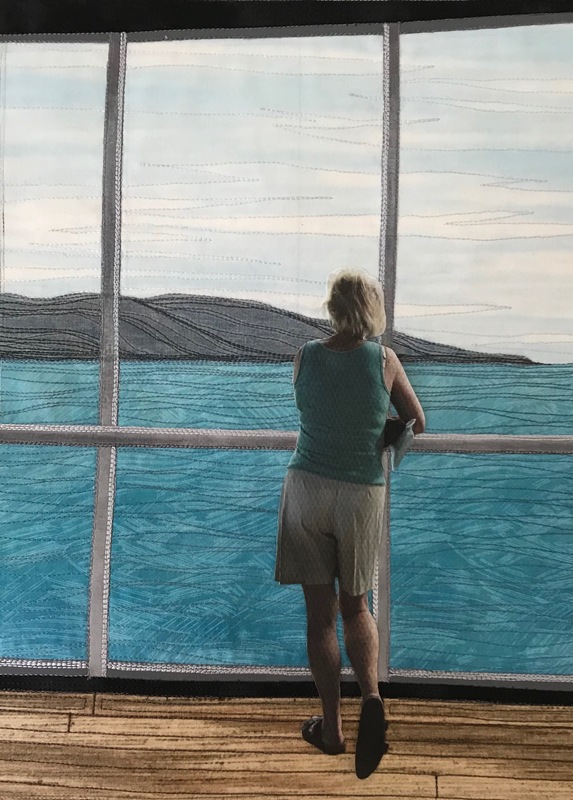 I’ve positioned (and sort of fused) the woman – now I need to stitch her in place using a clear invisible thread and a very narrow blanket stitch. Then I’ll be able to fill in shadow lines and other colour demarkations. I also need to add her shadow to the deck so that she’s attached to the rest of the image. Tomorrow! Finished these colourful socks last evening. They’ve gone in the give-away collection – while I have clothes in these colours I don’t need (actually, I don’t have room for) another pair of socks in my sock drawer!